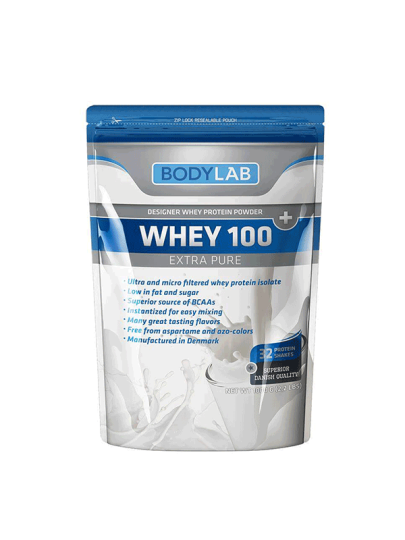 Bodylab Whey 100 is a whey protein powder produced in Denmark, which is obtained from cow's milk through modern and gentle filtration processes. Bodylab Whey 100 consists of a mixture of 100% pure and non-saturated whey protein concentrate and whey protein isolates of the highest quality. Whey protein is well known for its versatile amino acid profile, meaning it can be used in many different ways and combinations. Bodylab Whey 100 contains neither aspartame nor AZO dyes. Mix 1 of the mix with 3 dl of water, juice or low-fat milk in the shaker. Drink as the first course after training depending on the body weight absorbed into the water (better absorption) or in small milling milk (better taste). Add carbohydrates (glucose) to achieve better anabolic effect and fill glycogen reserves. It can be used as a first meal in the morning mixed with millet milk with oatmeal flakes. In a dry and dark place at a temperature of up to 25 ° C.